Username is your ID number. Ask your math teacher for password info. Always search by ISBN to be certain that you have the correct book. ISBNs are listed above next to each title. Please fill out both sides of your Hart District Textbook Condition Contract and return it to the library on the first week of school! It is to your benefit to turn in this card. 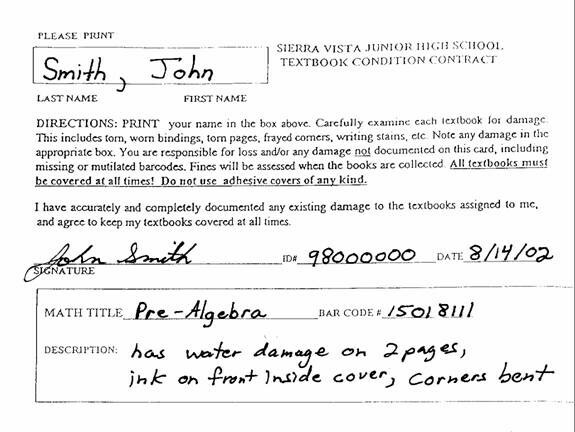 Any pre-existing damage of the textbook not reported on this card is subject to the fines as listed below. Be sure to cover your books! Protect them from any damage. Keep them away from small children and chewing pets!If you have any questions about how to fill out the card, please call the Teacher Librarian, Mrs. Fulleman, at 661-252-3113 ext. 2050.Thank you! A sample Contract Card is below. The bar code # is on the back, top right corner of the textbook. It is not the ISBN number. Remember to fill out both sides of the card and return it to the SV library the first week of school.